Back in 2013, California was debating whether to give teenagers who committed violent crimes a second chance. The proposed bill, SB 260, would allow juveniles to become eligible for parole earlier in their sentencing, after serving at least 15 years. That’s when director Ben Lear knew he had a film to make. Lear had been visiting "The Compound," a high-security facility where Los Angeles houses its most violent juvenile criminals. When he heard about the bill, he joined forces with screenwriter Gabriel Cowan to produce the documentary "They Call Us Monsters." 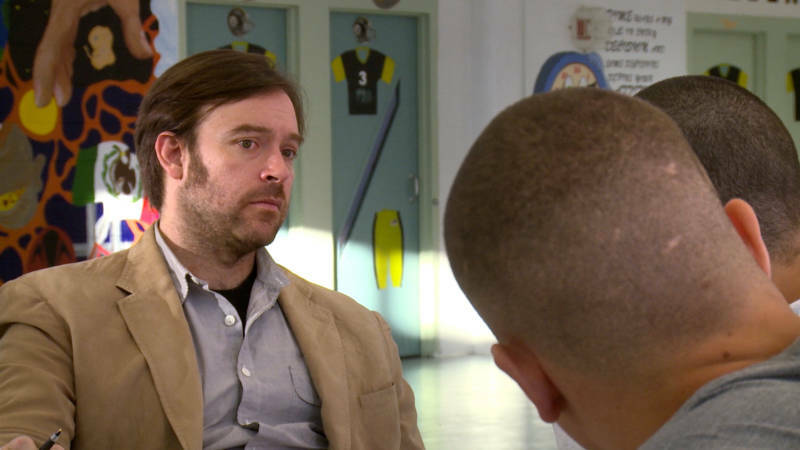 Cowan had the idea to start a screenwriting class for juvenile offenders after he gave a talk to incarcerated youth while working on another screenplay. Over the course of a few months, Lear filmed Cowan working with three teenagers -- Juan Gamez, Jarad Nava and Antonio Hernandez -- who were awaiting trial, some facing sentences more than 100 years long. Juan and Jarad were 16 when they were arrested; Antonio was 14. Cowan says the juvenile justice system in California is broken. Instead of rehabilitating youth who have committed serious crimes, he says, it’s punishing them. The film documents one of his first visits, when he asks the group to list their fears. Juan: “Death, loneliness, darkness, and love." Jarad: “I don’t like snakes, there’s a fear of heights, I’m not scared of heights, but there’s a fear. The dark." Cowan says that getting the teens to open up to him was a long and sometimes difficult process. He had the group do a number of trust exercises. But the three boys decided to do something mutually biographical. The plot emerged when the teens were talking about their fears. Juan said he was in love with a girl when he was 10, but was too scared to tell her. His story became one of the main themes in their film. “We incorporated that experience, the experience of telling someone you love them and how scary that is," says Cowan. "[It's] the loss of innocence of this kid, who in this one day, nearly loses his virginity, smokes pot for the first time, gets kicked out of his house, sees a drive-by shooting, and all while trying to tell this girl that he loves her." 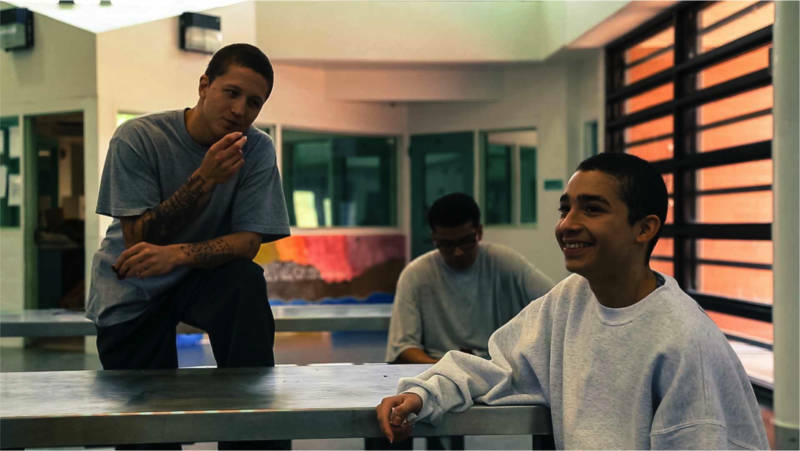 Encouraged by Cowan and his classmates, Juan ended up calling his 10 year-old crush inside the jail. This scene makes it into the final documentary, in which Lear braids together footage from the class with clips from the fictional film that the teens wrote. Reflecting back on his first week teaching his screenwriting class, Cowan says he was struck by the teens saying they don't have friends. "There's homies and there's enemies," he says they told him. Since the documentary was produced in 2013, the initial parole bill, SB 230, passed, along with other bills that decrease juvenile sentencing. This means these kids could get a second chance. In Jarad’s case, he'll likely come up for parole in 20-25 years, instead of the 80 or 90 years he would have had with a 160-year sentence. This is true for Juan as well, who has a 90-year sentence. PBS Independent Lens airs the film on Monday, May 22. To see the short film, "Los," written by Juan, Jarad, and Antonio, visit InsideOUT Writers.